Wow. It's been 4 months since I've posted on my blog! It's definitely been a whirlwind 4 months since that post about my SD 100-miler results. As you can imagine, I needed to take a bit of a break to regroup and figure out what the next steps will be. A lot can happen in 4 months. When you're in the moment, it doesn't seem like anything is happening but when you look back on it, it's crazy how much actually does happen. Sure, on a personal level, things are always changing with my family and kids. My twins are now ruling the 1st grade and my oldest is now in the 7th grade. I know. I've had a hard time accepting it and if I talk about it for too long, I'll cry. I've had so many ugly cry moments about this, I just can't anymore. All three are doing karate and my oldest is about to finish his second year of cross country. He's improved so much! I'm glad he's enjoying too. With my running, a lot has changed that I didn't really realize until I looked back on the past 4 months. I've become a lot more relaxed about my training (which is kind of huge). 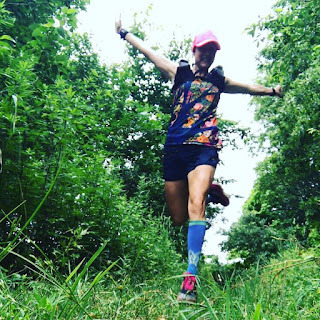 I was so heartbroken after the 100-miler, I wasn't even sure what I was going to do with myself. But my PIC Vanessa and I have come up with some new things to try. I've also tried to be more relaxed about things because I was burned out. I needed to step back and fall in love with running again. I also had to shift my focus almost entirely on my clients and programs. It's been a BUSY 4 months. 1. I've been coaching a lot of private clients and group programs, both in person and virtually. I started working as part of the coaching staff with the amazing Train Like a Mother Club back in April. I am coaching their Ragnar Road and Trail programs and our first program began in May. But it's a rolling program and while we focus on a few specific races (Ragnar Great River, Adirondacks and Ragnar Trail Alafia), the participants are all training for any Ragnar Relay. It's been amazing! I am captaining a team for the Trail Alafia race in December, which I'm super excited about. I was also headed to Ragnar Napa Valley in a couple of weeks with some of our participants and some good friends, but sadly it looks like the awful wildfires in the area will change those plans. In addition to the Ragnar programs, I've also been coaching their Stride into the School Year program this past September. It's been so much fun, I can't even describe it. The Stride programs are typically 5-week long programs developed to help you stay on track through an especially chaotic time of year (such as when the kids go back to school and summer fun is over!). The workouts are a combo of running and strength, with live Facebook sessions, super FUN workouts and contests each week. I highly recommend joining the Stride into the Holidays program beginning at the end of this month! I'm also coaching the Fall running program for the YMCA. We're training for the Surfing Madonna 10K and 15K and it's going so well. I can't believe race day is in a couple of weeks. And let's not forget the amazing work with my private clients. From the rock star cross country runners I worked with, to the amazing runners working towards tough Fall goals from 5K to 50K, it's been an amazing goal-crushing, rock star-studded summer. 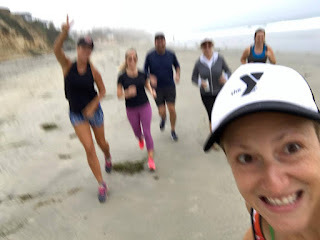 Running on the Beach with the Surfing Madonna group! New York trail running fun! 3. At the end of July, we went to Big Bear Lake with my PIC, Vanessa, and her family. This is our second family trip together and it was just as good as our trip together last summer. Maybe better. Big Bear is a beautiful place and we got to disconnect and relax. We also got to run some amazing trails. 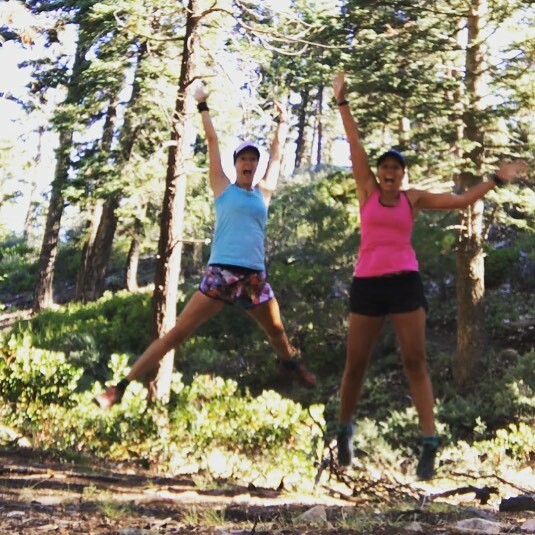 Running in Big Bear was pretty fun! 4. I got some new ink!! I have been planning my "family" tattoo since my twin girls were born back in 2011! I couldn't really decide what I wanted but things finally came to fruition. The tattoo on my ribs is all about my family. The cherry blossoms represents the DC area, where our story began. My husband and I met there, it's where we had our kids and it will always be special to us. The 5 blossoms represent the 5 of us, of course. And the text: "The best luck I've had is you" is from a Michael Franti song that I would sing to the kids when they were younger. It is the best way I can describe what my family means to me. The tattoo on my forearm is the end of the Robert Frost poem, "Stopping By Woods on a Snowy Evening." The words really mean a lot to me. On the surface, most people think I chose them because it says I have miles to go before I sleep. And I run a lot, so I must have lots of miles to run. And yes, that's true. But how I interpret it is that I have a lot of stuff I want to do before my time is up. I don't mean a bucket list with things I need to check off. In a broader sense, I just have a lot of life left. So many promises to myself, my family, my friends, clients. I feel like I'm just not done and I while running and goals are a part of that, it's the entire package of life and all the experiences left to experience that will keep me moving. Ribs didn't hurt as much as I expected! Don't get me wrong - they did freaking hurt! 5. I set some new goals. Yes, I'm going to try for another 100-miler in 2018. Which one is yet to be determined. In the meantime, I've made some changes regarding my nutrition while on the run (running exclusive with Tailwind at the moment), I've made some changes with my training (mainly with regard to mileage, strength and cross training) and I'm trying out some new socks and foot sleeves to prevent the blistering I had during the SD 100. And everything seems to be working at the moment. But what works at 20-30 miles may not necessarily work at 50-100 miles. So we're going to try things out at the Pirate's Cove 24-hour race next March. And based on how things go with that, we'll decide which 100 miler to do. I have some 50Ks on the books, as well as that Ragnar in December but nothing else right now. Trying to keep things relaxed and take them as they come. So far so good! Phew! Here's hoping I don't remain silent for the next 4 months! Fill me in on what you've been up to as well! I'm linking up with the Friday Five 2.0 link up, hosted by Rachel at Running on Happy and Lacey and Meranda from Fairytales and Fitness. When you're done here, be sure to check these ladies out! Sounds like life is busy for you! I hear you on feeling all the feels about your parents moving - it's so hard watching our parents age. The coaching gig sounds like a ton of fun. It's the hardest thing to see them age. I can't bear it at times. Being busy with work helps me to stay distracted from it. I love coaching for AMR! It has been a great addition to my coaching experience, for sure! It feels a little weird to be blogging again but hopefully I won't let it slide for too long again! Welcome back to the blogging world! Went back to read your 100-miler story and was so inspired. I agree with your friend. It wasn't a failure, just unfinished success and I'm looking forward to following your story as you take on another one in 2018. Awesome! Loved seeing what you ahve been up to! Can we do this in real life now too please? It’s so tough! I can’t even imagine when my kids are in college or close to it. My oldest has a field trip to a local college this month. Already. In 7th grade. It’s going way too fast for this mama! All kinds of changes and excitement, just when you didn't know what would be coming next! You're busy and dedicated to your family and friends and clients; I appreciate you for everything you do and what you mean to us. And you never stop inspiring me. Great tattoos, BTW! Thank you Steve! Not only for your kind words but for always being there for me, no matter what. You’re a great friend and my BFAM! Wow! There IS a lot going on in your world -- mostly very exciting things. I've done some of the AMR programs and always enjoy them, but now that I work with Rachel one on one I don't really feel the need for that. Although I am scheming with one BRF on going to the AMR Retreat they are promising next Fall on the East Coast . . . Funny, I couldn't wait to move away from NY (where I grew up) and yet here we are, we got sucked back up here. And someday we'll move away again. I totally get the older parents thing -- although I'm guessing yours are younger (mine are 89 & 91). It's been a very difficult few years with them and not likely to ever get any better. :( It's very hard and it's very stressful, but that's the one good thing about the fact that we now live in NY -- we're only a couple of hours away from them. I actually couldn't wait to move away from New York either. But I always went back as often as I could to visit.